Estelle Carol was a co-founder of the Chicago Women’s Graphics Collective in 1970 and a founder of the Herstory Website Project in 1999. Active in the draft resistance movement during the Viet Nam War, she joined the Chicago Women’s Liberation Union in 1969 after a stint in the Women’s Radical Action Project (WRAP) at the University of Chicago. She is currently the owner of a home business, Electronic Illustration and Design. Most of her work involves illustration and graphic design for non-profit organizations, unions, advocacy groups, magazines and children’s books. Her online portfolio is located at www.estellegraphics.com. With her partner Bob Simpson, she also draws labor cartoons under the name Carol*Simpson. Her cartoons may be seen at www.cartoonwork.com. She sees her current business as a continuation of the work she began in the Women’s Graphics Collective. Rebecca Zorach (RZ): Could you start by telling me about how the Chicago Women’s Graphics Collective was formed and what sort of issues you were responding to at the time? Estelle Carol (EC): It was the fall of 1970, and it was the early period for the Chicago Women’s Liberation Union, which had formed in 1969 or so. It was a socialist feminist organization—it was an umbrella group for many smaller groups, originally smaller groups that had united together under that one banner. And once that happened, then the energy just bubbled up to form new groups within the banner of the Chicago Women’s Liberation Union. So, the, some of the artists decided that since culture is the key to women’s revolution, we needed images, we needed artists, we needed our own art. We needed that to be the publicity for this new change that was going to explode. And in fact it did, explode, very soon after that, because of all the newspaper articles that started in New York, and it became mass, mainstream. It became very well known. So, we started in the home of one of the artists and we set up our silkscreen tables in her porch. We didn’t know advanced silkscreening yet and we had to start this journey to learn how to become expert poster silkscreen artists. And we quickly gathered many other people who thought this was a cool idea, and we defined the principles of what our group would be, which was collective art, which meant something fairly unusual at the time—creating collectively. So instead of having a studio space where individuals created their individual works and shared the equipment and the materials, we didn’t do it that way. We shared everything. We shared the creation process. And that was an essential basic agreement. We felt that sharing the creation project made it possible for more women to become artists, or at least explore art, because the few of us who had more traditional art training could show the way and people could share their skills. But everyone’s skills and ideas were valued equally. RZ: And had you done silkscreen before? EC: No. I went to the Art Institute to take a class in photo silkscreening so that I could bring the skills back to the collective. I was one of the few people who actually had some formal art training. So it made more sense for me to do it because I had the money to do it. So, we set up our first photo silkscreen darkroom in my bathroom because it’s very much a water process as most darkrooms are, except huge—because you have to do the development process on these large silkscreens. So you needed a bathtub-size place to do all your stuff, you can’t just do it like a small photo pan would be. We would create stencils, and then expose this photographic emulsion that was applied to the silkscreen. It was very labor intensive, and the inks were toxic—it was not a good idea to have this toxic studio in people’s homes, where they were living [chuckles] and their partners and their roommates and their animals were living. So after a while we eventually realized that we had to get a studio space. We rented one of the rooms in the building where the Chicago Women’s Liberation Union had their main office, which was on Belmont Street, 852 Belmont Street. Which is now a very classy neighborhood, but it was not then at all, it was a very down and out neighborhood, which was perfect for us because we couldn’t afford high rent. I think the whole, the bathroom and the two room studio that we had was fairly small and the whole thing I think was $125 a month or something like that. So, it was very cramped and there were people in there all the time, and it was cluttered and it was still sticky and smelly and polluted because the new technology in silkscreening with water-based inks hadn’t come in yet, so we were using oil-based inks. And we would all work together and manually silkscreen everything, so we would do like 50 to 100 posters at one time. And we’d hang them up, we didn’t have driers, we would hang them up on clotheslines with clothespins. Which worked. As long as you didn’t get near it. EC: Yes. Right. And since we sold them nationally and actually internationally, the sales of these posters were just tremendous, we had to be reprinting them a lot. So it got to be, after a while, incredibly difficult to hand silkscreen all of this stuff. At some point the few that we needed in huge quantities, we ended up going to the worker-owned collective print shop called Salsedo Press, and we had them do offset printings of some of the posters. See, the reason that they sold so much and they were so popular is because they were so incredibly affordable. And that was the other mission of the graphics collective, was to make art affordable to everyone. So we sold the posters for a dollar fifty each. And they were huge, you know, they’re 26 by 20 inch posters for $1.50 each, basically archival quality fine art for a dollar fifty each, which today is crazy. I mean, if you sell the posters of that period today, like on eBay, they sell for like between $100 and $200. But we didn’t care about money—it was the message. It was projecting the ethic of women’s power to create, to recreate the world. So, you know, we had publicity, we had articles about us in the mainstream newspapers, we had articles about us in the women’s press. We would go on marketing tours—since there was no Internet, of course, we had to physically market these. So we would pile the posters in our little cars and we would just drive all over this country. And we would just stop at women’s centers and bookstores and communes, you know, we would sell them wholesale to the people who would resell them in their city. And then we would also have this mail-order business. We had a catalogue, a printed brochure that we would mail everywhere, and people would clip the catalogue and fill out the form and mail it to us with their check and we’d just fill the order and send them out in mailing tubes. It was a lot of work. It was huge. So eventually, I mean, it was so much work that there was no way that we could just do it volunteer anymore. And there was so much money coming in from the sale of the posters we were able to hire two of the women to part-time do a lot of this work. So it was part of their actual, they didn’t have to work other jobs anymore, they could do Graphics Collective work. RZ: And in terms of the membership, how did the group change over time? You mentioned that when you started up, a lot of people got excited and wanted to join. Were they people who had been part of the movement already or were they just excited about the imagery? How did that work—how did the collective itself change over time? EC: Well, I think that the recruitment thing was similar to what happened in many of the other small collectives and chapters and workgroups within the Chicago Women’s Liberation Union. Since we were recruiting new people so fast, through all the mechanisms of outreach that we had at the time throughout Chicago—dances and consciousness-raising groups and chapters on college campuses and pregnancy testing centers and the liberation school. There were so many outlets and ways for people to find out about this, and then once they got hooked on the idea of women’s liberation then they would start poking around and looking for, “okay, which one of these groups do I want?” So we would end up with people who were brand new to the Women’s Union, but you know, the passion of the newly converted! They would just land on our, in our group and check it out, and if they liked it they’d stick. We welcomed people and we would teach them everything we knew. So, some of them were older, were accomplished artists, and some of them were teenagers. It varied quite a bit. RZ: Was there a lot of turnover? Was the composition of the group constantly changing? EC: It turned over a fair amount. There were some people who would stick around for three or four years, and, you know, in the second phase, after 1975 or so, I don’t really know how fast it turned over. They didn’t really close their doors until ’83, so that was, what, thirteen years? And some of those people stuck it out that entire time. They were very loyal and very hardworking. RZ: And you moved on around ’75, is that right? RZ: What was the collective process like, working together? You talked quite a bit about the process of actually printing the posters and distributing them, but what about the artistic decision-making process—what was that like? EC: Well, we would get together roughly once a week or when someone wanted to discuss a possible theme. One woman kind of became the leader. All posters were designed in these collective meetings, brainstorming sessions called “poster thinks,” but usually there was one person who had a theme, to start it out, that they were passionate about. And we would just brainstorm images and slogans—usually the slogan came first. We wanted to be accessible and make sure everybody got it. We didn’t want stuff that was too esoteric; we wanted stuff that would be visually a clear message. And you wouldn’t have to ponder it. Which is kind of the same kind best practices that a graphic designer would use for doing publicity or a flyer or poster for anything. It was just basic commercial art. None of us really had formal training in commercial art, but it was the common sense way to do it. In fact commercial art studios often do work collectively like that — it’s just the fine artists who don’t do that. We were people who had gone to art school, some of us, wherein the image of the artist was this individual lone person that had to bring up their true self and their unique aesthetic and they had to do it all on their own and if they didn’t do it all on their own they were a bad artist. So that was the stereotype of what art was that we had absorbed through school. So we consciously and very forcefully said, we don’t want any of that. We were naïve enough and untrained in the field of graphic design and commercial art that we didn’t even realize that that’s how people did it, anyway. [chuckles] I mean, it wasn’t until some of us went on to degrees in graphic design that we finally realized that there is such a distinct separation between the commercial arts side of the artistic contribution and the fine arts side mean. The whole aesthetic and self-vision is so totally different, it’s kind of scary at times. You know, given that I’ve done both, I started out as a fine artist and then moved into the graphic design field. We just did things collectively and I guess the difference between how people do collective art these days and what we did then was there wasn’t any clear designated authority. Today you’ll have a creative director, but back then in the graphics collective, we made sure that everyone had an equal voice. It was by consensus. RZ: And did that work well? RZ: Were there ever conflicts that were not possible to resolve? Or conflicts that were a challenge to work through? EC: Sometimes there were conflicts. But then the group would just split, we’d have separate poster thinks for the faction that thought one way and another for the faction that thought another way. The whole group didn’t have to design a whole poster. It was an incredibly flexible system. The leader could invite three or four people to be on her team, she didn’t have to have the whole dozen women who are in the graphics collective to do it with her. Unless she wanted them to be there. RZ: And it sounds like people were pretty generous about letting go, like, that’s your thing and you’re gonna do your thing, and this is our thing and we’re gonna do our thing. EC: Yeah, we encouraged people to do their thing as long as it was collective. RZ: You talked about the fact that you sold the posters really widely all across the country, and that must have gotten a lot of visibility for the women’s movement in general. I’m curious between the relationship between the visibility of your imagery in Chicago versus the rest of the country. Did you feel like you were more visible elsewhere than in Chicago? EC: I don’t know for sure, but the feedback that we got at that time and then have continued to get even over the years is that it was all over the country. People knew these posters in every major city. You know, it was all over. Because they had women’s bookstores and women’s collectives in most major cities and they would have the posters. They would have them in their offices, in their homes. You go into women’s studies, gender studies programs today and they have them up on the walls of their academic offices. RZ: Did people ever carry them in protests? EC: Oh yeah, they would become picket signs. We put them on El stations, we put them up with wheatpaste. They’d be reproduced in bulk. They’ve been reproduced in books and calendars and all kinds of stuff over the years. RZ: So are there any particular examples you can think of where you saw some of your posters being especially effective at conveying the message to an audience? I mean, aside from just their popularity, which sounds like it was really evident, any particular messages that you think got across especially well through the posters? EC: There were different posters for different occasions, so if we were doing a health fair, the women’s health poster would be up behind the table, and that would be. And sometimes we’d put the posters on signs, carry around signs and walk around the fair. Draw attention to what we were doing. And then the lesbian posters would be the focus when it was a lesbian event. So, we made sure we had a poster for every occasion. 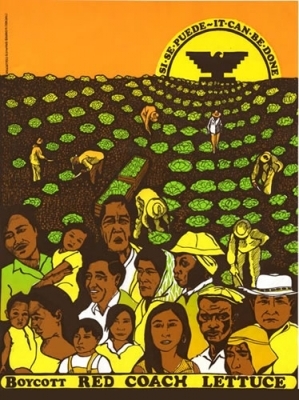 Of course, the farm workers poster, which was not a feminist poster—most of our posters were about feminist issues but a few of them weren’t, because we cared very deeply about other social justice issues—the farm workers poster was widely used all over the place, to promote the boycott lettuce campaign. RZ: And how did that one come about, that poster? EC: Well, Leslie Nevraumont, one of our original members, just got passionate about the boycott lettuce campaign, and she was determined to create a masterpiece and she succeeded. You know, with our help. And it was in the Smithsonian Institute for a while, in one of the cases there, I don’t know if it still is up there or not. It must be in their archives. It was very very popular, it’s a beautiful poster. RZ: Did that involve the group having to make a decision that it would make a poster that wasn’t specifically about a women’s issue? EC: Well that was always part of our mission, we were always allowed to do posters that were not about women’s issues. Because that was one of the principles of the Chicago Women’s Liberation Union. which we were a workgroup of, that we supported justice issues for everyone. 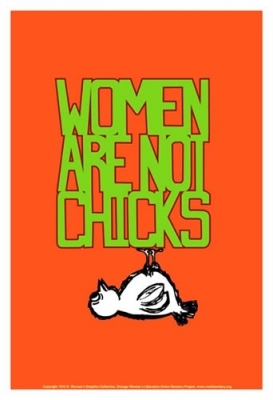 We made it a point to make posters about larger issues than just feminism. RZ: And was that ever something where you had to think about, “okay, how much time and energy are we going to put into women’s issues specifically, versus how much time and energy we’re going to put into other social justice issues?” Or did it just kind of happen naturally? EC: It just happened. It may have come up, I don’t recall, specifically, it coming up. It’s just that if someone had the energy to do it, it, they did it, they made it happen. RZ: Are there other examples you can think of where you were forging solidarities across race or class or sexual orientation…? EC: Yeah. Well, one of the reasons why we printed the Vietnamese women’s poster, we call it the Lipstick Poster. One of the reasons we got permission to reprint this from the design that was done by a famous poster artist in Cuba was because originally it was about Vietnam. Because the blood coming out of the Asian woman’s nose is actually the shape of Vietnam. So it was, the contrast between what imperialism does to Third World women, was very important. And then we did another poster about the liberation of Guinea-Bissau during the time when there was a huge arms struggle there, a guerrilla movement there. And we did a huge poster in support of that. We had another one about Latin America, Puerto Rico, I think. We did a lot of posters about anti-imperialist themes. RZ: Were there very many African-American women in the Chicago Women’s Liberation Union? EC: No. There weren’t. At that time the African-American, the Black movements liked to maintain their separateness from the Latino movement and the white movement, and the women in the Black Liberation movement stuck with that convention at that time, so there weren’t. But you see, the way we compensated for that, I mean, everybody knew it was kinda—well, not everybody—but a lot of people knew that this separation of the identity politics was a little awkward, so the way we compensated for it was that we would have coalitions. So, the women’s union would be in coalition with the Latino, Mujeres Latinas in Acción, and in the, with the women in the Black Panthers and we would coordinate our work, a lot of times on health issues, because we all had health clinics, and things like that. So we would know each other and we would work together, but we just weren’t officially in the same organization. That’s how we handled it. RZ: So, a broader question: within political movements, why art? Some activists don’t have a lot of patience for art in the context of politics and feel like “we just need to get our message across, we don’t have time for art.” Maybe the kind of work that you did in the graphics collective felt direct enough to people that it didn’t seem like a distraction from the “real” political work. EC: No, that was never the culture of the women’s movement in Chicago at all. If there were people who felt that way at that time, which I’m sure there were, they were in some other organization. Because we had our distinct culture, and we felt that art and music and expression were the heart of our movement. That’s how we recruited people, that’s how we expressed ourselves, our message. That’s how we made people feel that we were a cool movement and people should come and flock to us. It was through culture. We all understood that culture was one of our main tools for organizing. Why would we belittle culture? It wasn’t like that at all. RZ: There was a band, also, right? And were there other art forms aside from music and visual arts? EC: Those were the two main ones. There were the two workgroups, and we had the writers, we had Womankind, which was our newspaper, our main outreach newspaper, and that was also a creative thing, it had more direct organizing goals. But then we had other newspapers, we had Secret Storm and we had Blazing Star, which was the lesbian newspaper. So we had the writers and the visuals and the musicians pretty much covered. EC: We didn’t have a theater group. RZ: Was there any feminist theater in Chicago in that time period? EC: There might have been, for a short time? But I can’t remember offhand. RZ: So, maybe you could talk a little bit about what the experience meant to you, personally, and how it’s informed your work since then. EC: Okay. Well, I’ve kind of kept that same culture, that same understanding of how visual arts and all the arts are the center of effective organizing. I’ve kept that belief all these years. So, that’s why I’ve used my art in political ways to this day. I still do it. It’s kind of morphed into other forms, mostly online forms. Website forms and graphic design and things like that. But, it pretty much started me out on that path and I never left it. RZ: What about the collective aspect of it? Because your work now is a little more individual, right? EC: Well, it is. Yeah, I’ve missed the collective part. I mean, I have a team, we do work together but a lot of my paintings I actually now have to do by myself, because there’s nobody around really interested in doing collective art in that degree. We do collective websites, and we do kind of collective publicity posters. I mean, all graphic artists do that, they have their client and their client becomes their little brainstorming team, and it’s called art by committee and a lot of graphic designers make fun of that. But, it’s still there in some morphed form. RZ: When people talk about the feminist movement in the 70s and about consciousness-raising, the idea is often that there was a collective experience that you had to go through and then it changes you not only as a group but as an individual. Do you feel that the fact of having gone through that collective work process changed you? EC: Yeah, it did. I still need a group of some sort to do art with. I’ve always needed that, and because of the Graphics Collective experience, and that’s why I can no longer be a traditional artist, who’s supposed to work by themselves. I can’t do that. I can’t work by myself, I have to work with my clients, my studio teammates and my assistants, and we all have to critique each other’s stuff and help each other and, you know, it’s just natural. I can’t work any other way. RZ: So, maybe we could talk about some specific posters. You talked about the Lipstick one, can we look at the Chicks one, maybe? EC: Sisterhood is Blooming, this one’s over the thirty years, what is it, forty years now that we’ve been selling these posters, this one has sold more copies that any other. And I guess it’s because of its simplicity, and it also is actually, we reprinted it on a t-shirt, a black t-shirt of course, and those sell quite well too. RZ: And how did that one come about? EC: This one was a vision that I had, and I kind of just saw this in my head. RZ: The whole thing, or did it get tweaked? EC: Parts of it, and then the group did a poster think and we all kind of helped work it along. It was in the 1970s, it was one of the first posters we ever did. So it was a long, long time ago. But I was the leader of the team, though, that I remember. RZ: How did you do the text on that? Was that just like freehand design? EC: Remember, there was that stuff called PressType? EC: Sheets of letters and you rub them down? That’s how I did it. RZ: Is that just different sizes of that? EC: Yeah, it’s just different sizes of PressType. EC: You would create the design on paper, and then you would shoot a film, and you’d enlarge it. Or you could draw on clear acetate, and you could make a film manually. Usually what I’d, if we needed a giant film, I would take the image to get it shot on this humongous, 30, 40 foot flatbed camera or a service or something that would do it for you, make a film. RZ: How about the Maternity Center one? EC: This one was Leslie Nevraumont, she was the same one who led the boycott lettuce poster. She had just had her first child, and the, there was a workgroup that was trying to save the Chicago Maternity Center, because the new women’s hospital was trying to shut it down—the maternity center did home births, and had since the 30s. It was led by this totally brilliant, remarkable obstetrician named Beatrice Tucker, and it was the safest, cheapest, most wonderful birthing system probably ever to exist in the United States. But of course the medical health establishment had to shut it down, it was too much competition for their new women’s hospital. So it was done to, in solidarity of this campaign. RZ: So it did eventually get shut down? EC: 1972, this poster was 1972. I don’t know exactly when it actually got shut down, but the whole story of the Chicago Maternity Center was a documentary film made by Women’s Union women who were working with Kartemquin Films and it’s an amazing documentary. And it was just re-released on DVD by Kartemquin last year, so you can buy it on their website. RZ: Maybe you could talk about this one? EC: This one, well, okay this one is a very interesting, because it’s eclectic. It was done in a much broader, bigger collective process than, ‘cause the graphics collective didn’t actually design this. 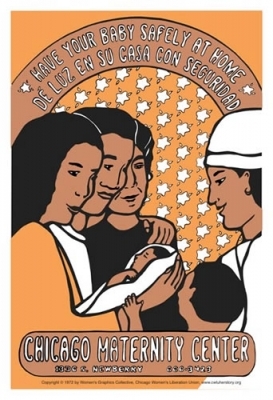 The image was done by Emory Douglas, from the Black Panthers, and it was originally a full-figure woman with a baby on her back holding a gun, done in a black drawing, because that was his style. And the graphics collective in Detroit took that image and made it into this colorful, totally different style, and put a poem to it. And then we found this, we got this poster from the group in some way, maybe secondhand, because they were not existing anymore and they weren’t publishing it, and we just thought it was so wonderful that we had to republish it. And sold many, many copies of it for them. And I wish someday one of the women who actually did this rework of Emory’s illustration would come and tell me who she is, but no one ever did. RZ: So—of course these are the days before the internet—were there lots and lots of these kinds of political posters circulating, that you could easily get in Chicago something that was printed in Detroit, or something that was printed in San Francisco? Were there distribution channels? EC: There were the bookstores, you know, there were lots and lots of political bookstores, a lot more little independent bookstores than there are today. And organizations would also bring in posters and sell them at events. Yeah, there were posters. I mean, without the internet, paper was the only way to share our message and share our art. You might say there were even more posters than there are now, because we have so many other outlets now. RZ: And what were some of the important bookstores where you would go and get political information, posters and things? EC: Well, the most important one of course was Women and Children First, which luckily survived the turmoil of the independent bookstore disaster. There was Sisterhood Bookstore in Los Angeles which died, and there were many others, I can’t remember their names. In Chicago, there were other political bookstores, there was Revolution Books, I think it was called. The Guild bookstore? I don’t know. There were others and I can’t remember their names. I don’t remember which bookstores actually had posters and which didn’t, but Women and Children First always had posters. I don’t know what year Women and Children First was founded, it may have been later in the 70s, I can’t recall. They’re still wonderful. RZ: Do you have any concluding thoughts about the importance of the collective and what it meant to you, or what it meant to other people? EC: I think there’s a lot of emotional impact even today, even among young people who didn’t experience it forty years ago, but among people of my generation, brings back a lot of fun times. EC: Yeah, many times, because I go to conferences and fairs, and I’m there trudging along with my posters so I get the full impact. They’re usually, a lot of people when they see this stuff, they go “oh my god, where did these come from? These are so cool!” you know, that kind of stuff. That’s usually the reaction. For the people who are into that kind of expressiveness. You know what I forgot to say? In about 1998, a whole bunch of people got together and decided to put the legacy of the Chicago Women’s Liberation Union on the web. 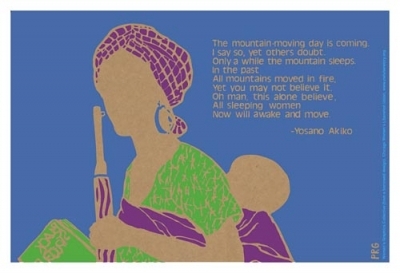 So if you go to the website, the cwluherstory.org website, there’s a huge digital gallery of the Women’s Graphics Collective posters. And then there’s also an online store of about 15 or 16 of the most favorite of them, that people can buy as reprints. People just go on the internet and buy these online, and they’re, and it’s the money that comes in from selling these posters is the only source of income for the website, the historical archive. So the posters have a second life. They not only get circulated among the next generation though the website, but they’re the financial reason why the project can even survive.